Hello :) I love, love, love cards that have pretty watercolor on them but I never seem to be able to use watercolor correctly. I am going to keep trying though. This card is kind of a cheat on watercolor. First I masked off my water color cardstock so that only a strip in the middle was visible. I used Altenew's Bold Blossom set in shades of pinks and greens along the open area and then took a waterbrush before it completely dried to blur the lines a bit. Once I took the masking off I used a wink of stella on the higlight parts of the flower to give it a little shimmer. 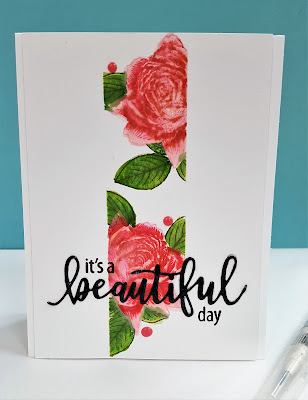 The 'beautiful' is a die cut from C&9th's Beautiful You die and the little words are from the C&9th's Beautiful Words set. 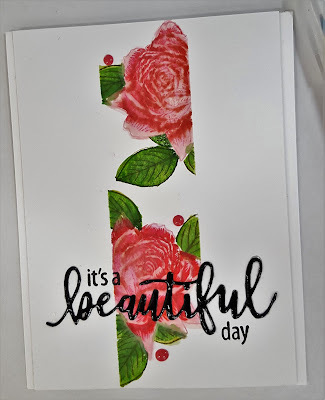 I used glossy accents on the die cut to add some dimension and then a few Nuvo drops too. I adhered the panel to a top folding card to finish it off. Gorgeous card Cheryl! Great design with the masked strip and your beautiful watercoloured blooms. The black die-cut and stamped sentiment is perfect. Thanks for sharing with us at CAS Watercolour! It looks lovely, love the look where you have masked it off. Beautiful roses, Cheryl! And the die cut sentiment is perfect! This card makes me think of a beautiful day! Thanks so much for sharing this with us at CAS Watercolour! Love the masked-off panel to showcase part of the roses. Perfect with the die cut sentiment. Thanks for joining us at CAS Watercolour. Beautiful layered inking of your roses and interpretation of the sketch challenge. TFS and joining us CAS Watercolour, Cheryl. Hugs.. It's a beautiful card also! Wow!